Choose a black leather biker jacket and black sunglasses if you're searching for an outfit idea for when you want to look casually cool. Bump up the cool of your look by wearing beige low top sneakers. 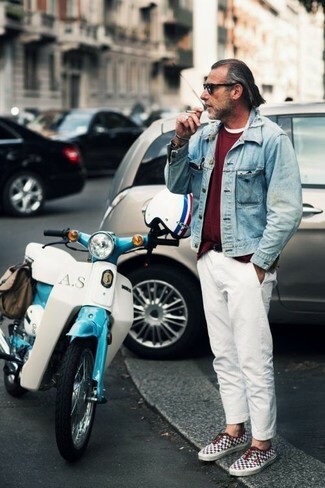 We're all seeking comfort when it comes to dressing up, and this combination of a light blue denim jacket and black sunglasses is a wonderful example of that. Rock a pair of burgundy low top sneakers to show your sartorial savvy. 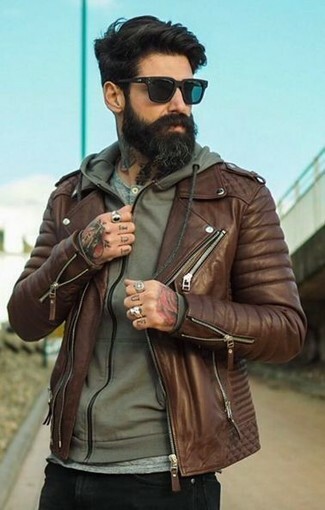 We all getup for comfort when it comes to dressing up, and this combination of a brown leather biker jacket and Carrera Eyewear safari 62mm aviator sunglasses from Nordstrom is a good illustration of that. If you prefer functionality dressing when it comes to your personal style, you'll love this stylish pairing of a grey vertical striped blazer and Carrera Eyewear safari 62mm aviator sunglasses. Up the cool of your ensemble by rounding it off with white leather tassel loafers. 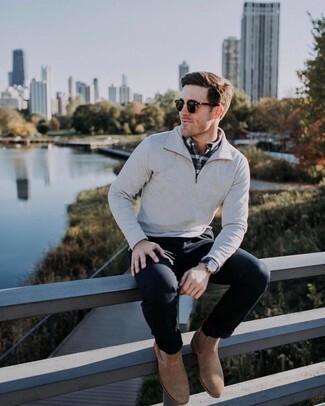 This combo of a grey zip neck sweater and Carrera Eyewear Safari 62mm Aviator Sunglasses is on the off-duty side yet it's also on-trend and truly sharp. Complement your ensemble with brown suede chelsea boots for a dose of polish. 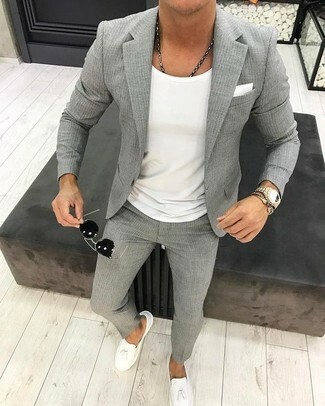 Consider teaming a dark brown plaid double breasted blazer with black sunglasses, if you feel like relaxed dressing without looking like you don't care. Amp up the cool of your look by complementing it with dark brown leather double monks. 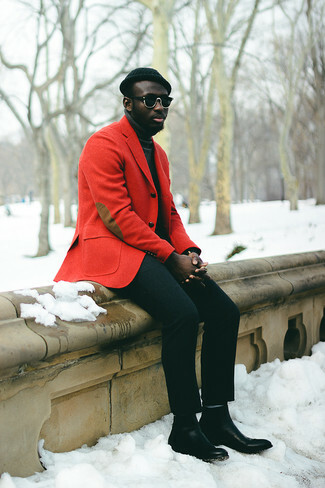 We're all seeking comfort when it comes to dressing up, and this combination of a red wool blazer and black sunglasses is a great illustration of that. 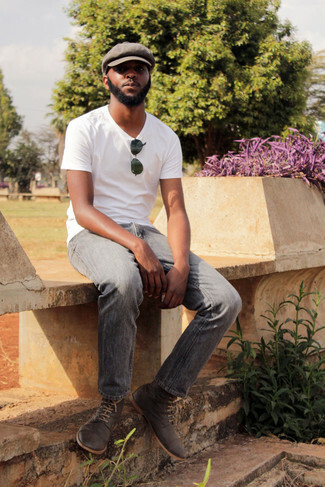 Sporting a pair of black leather chelsea boots is a simple way to add extra flair to your ensemble. 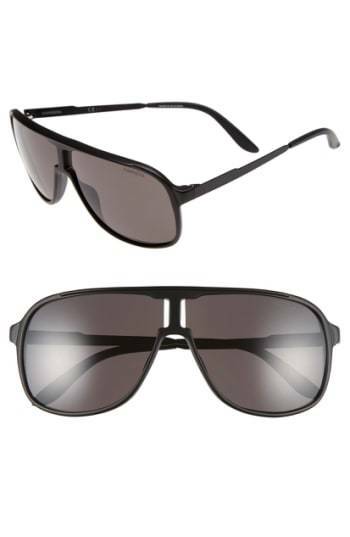 If you prefer functionality dressing when it comes to fashion, you'll love this easy pairing of a white crew-neck t-shirt and Carrera Eyewear safari 62mm aviator sunglasses. Got bored with this ensemble? Enter charcoal suede desert boots to shake things up. If you're on a mission for a casual yet stylish look, consider pairing a grey suit with Carrera Eyewear safari 62mm aviator sunglasses. Both pieces are totally comfortable and will look great paired together. Finish off with white plimsolls and off you go looking dashing.